A parcel from Berlin today brought a remarkable Leica III with even remarkable Elmar 5cm 3.5 lens, and a chrome VIDOM viewfinder. It has a 5-digit serial number and was made in 1928! First a small note to those that do not understand the excitement of Leicaphiles when finding such a camera. No, it does not shoot better pictures when you figure out its provenance and design variations. Also, it does not increase the value significantly, since upon selling it you would have to find someone that shares your views on the design improvements this camera received during its life. So, why bother? Just because it is fun to find those things out and speculate on the exact chain of events that led up to the camera that sits on your desk, the camera that you take out to shoot. The newly-received camera has serial no. 11378 and thus the Leica Pocket Book lists it as a Leica I from 1928. 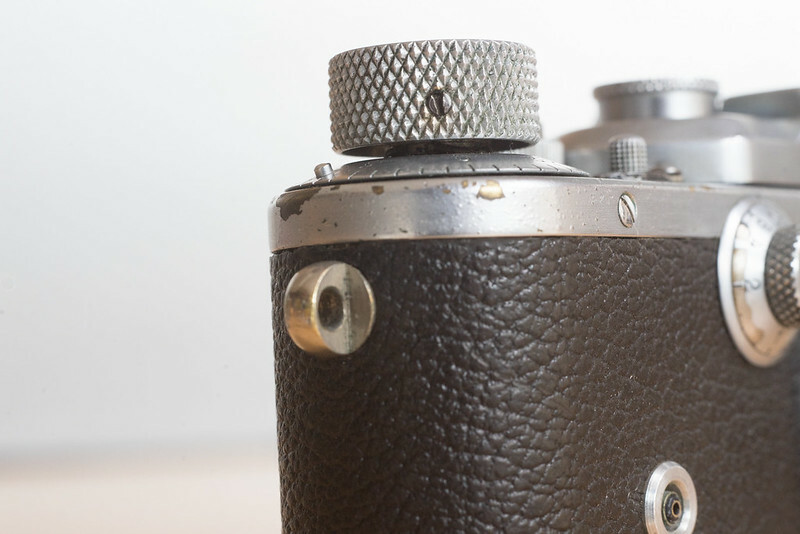 What a Leica I from 1928 looks like? Wel, like the pretty black one below. 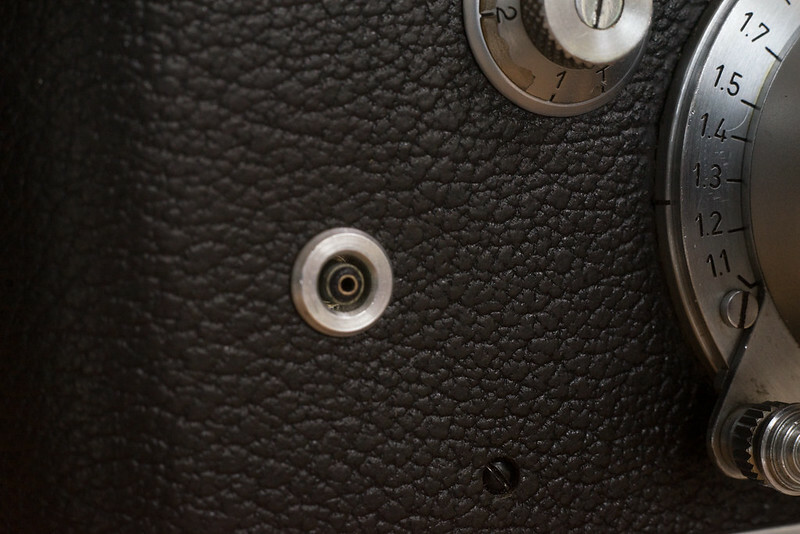 The original Leica I had a fixed Elmar lens, a 'hockey stick' infinity lock on the body, a peephole viewfinder and a raised dome under which the shutter speed mechanism sits. 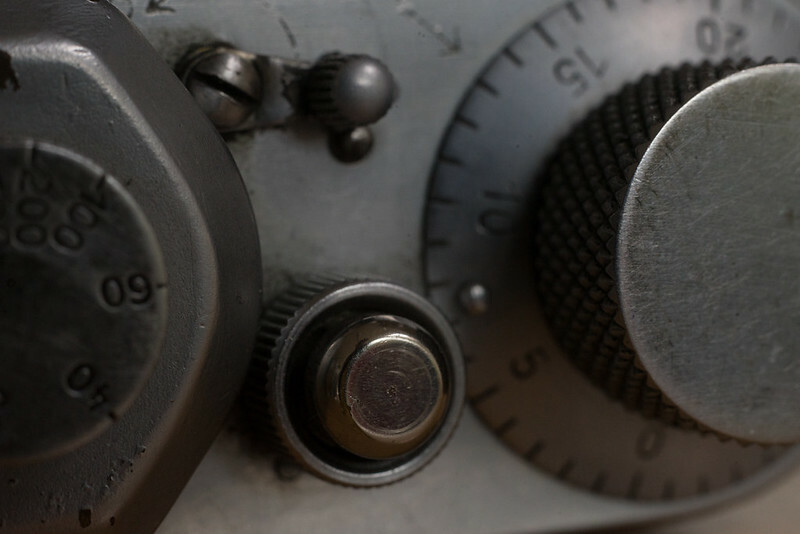 Also notice the large shutter speed dial, the large diameter rewind knob and the large dome shaped shutter release button. And actually, that camera in the French museum is 1333 numbers later than the camera I got from Berlin. 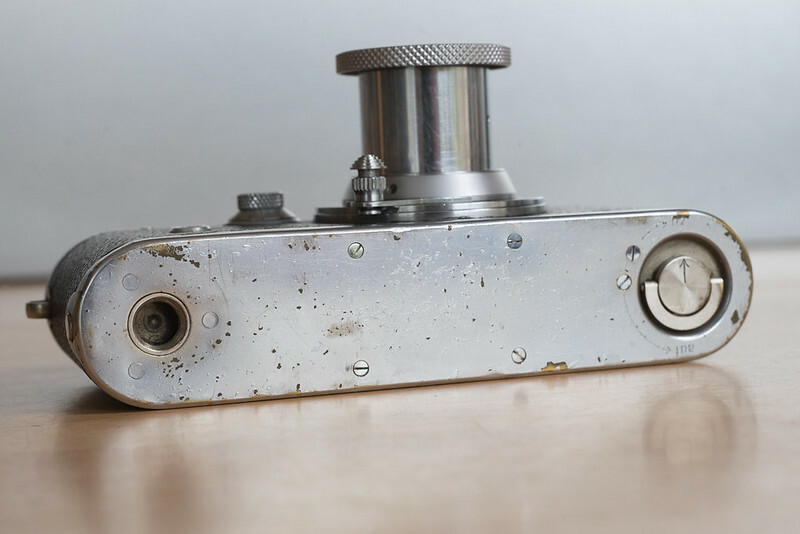 But, the newly-received camera is now chrome, and has a rangefinder housing from the Leica III, a body shell from the Leica III and a flash sync on the front of the body, where in later models the selftimer would be. The flash sync looks like a Leitz modification, not the 'sticking out' kind of thing but nice and flush with the body. I tested it (of course!) and it works as intended. But, the location of it is unusual. 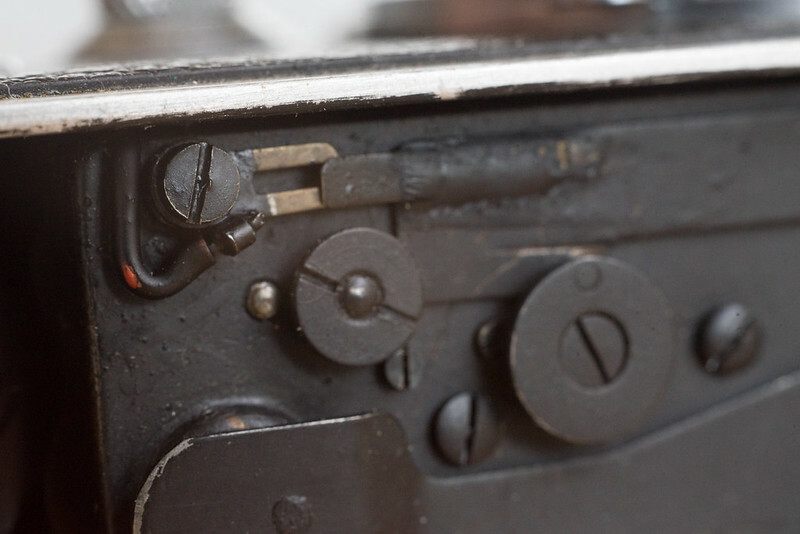 Leitz flash syncs commonly were installed on the rear side of the rangefinder housing, under the accessory shoe. The flash sync on the inside is also very neatly installed. The chrome on the camera: at first I thought it could not be original. But, the chrome on the top and bottom plate matches the quality of the rangefinder housing very closely, and the rangefinder housing was not re-chromed. 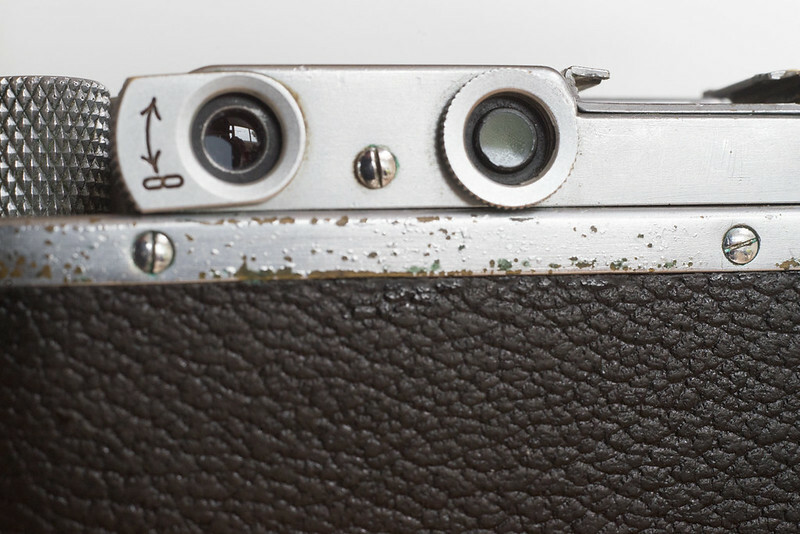 The engravings are too 'sharp' for a re-chrome, but the engravings aren't as perfect as those on my Leica II from 1932. They're a bit shaky. Like someone re-did them. Not everything on the camera was converted to chrome. The strap lugs on the body are nickel. As a Leica I, this camera would not have had strap lugs. And, since it now has a slow times dial on the front, this cannot be the original body shell anymore. So, the original was replaced with a shell that had nickel strap lugs. Interesting! The latch on the bottom plate also wasn't replaced with a chrome one but left nickel. 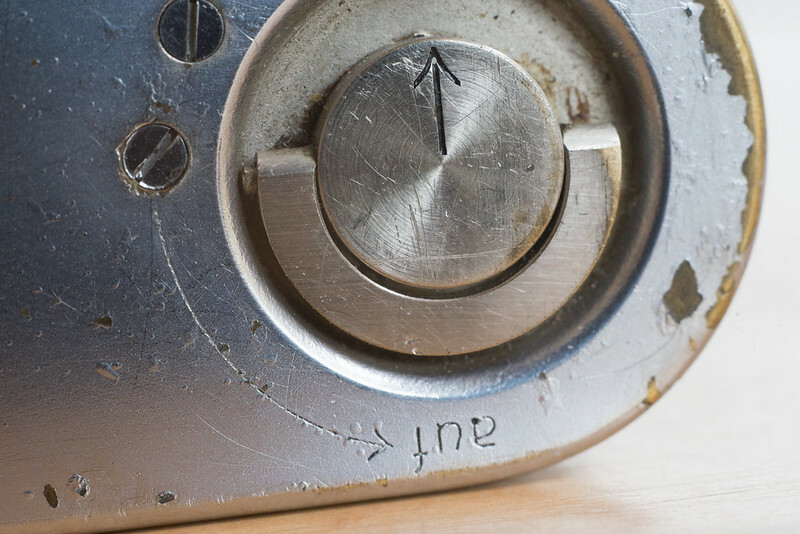 And the shutter button is also still nickel. Which would also have been left nickel with a Leitz conversion, since it is an integral part of the shutter assembly. To replace it would require a shutter assembly dismantle. The lens puzzles me even more. It has a serial 99045, signalling a 1930 production. Yet, it has a focusing mount that takes 180º to focus instead of the almost 360º of early Elmars. It also has faint red lettering on the distance scale, it has a modern scale(!) aperture scale and the lens is coated(!!). How on earth did that come to be? It's essentially a completely rebuilt lens with the 1930 serial number left on it! 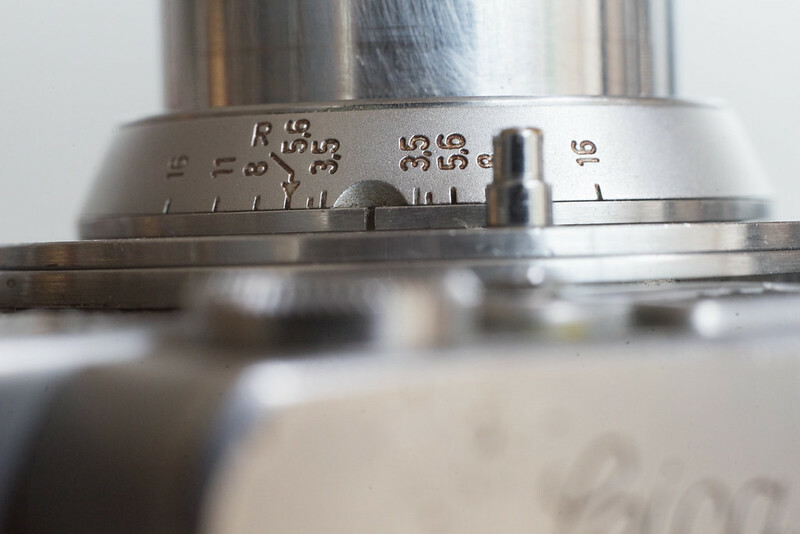 You can see the remains of red paint in the engravings on the aperture scale of the Elmar 5cm lens. In the 1930s and 1940s it was quite common for repairmen to upgrade cameras outside the factory-offered upgrade program. 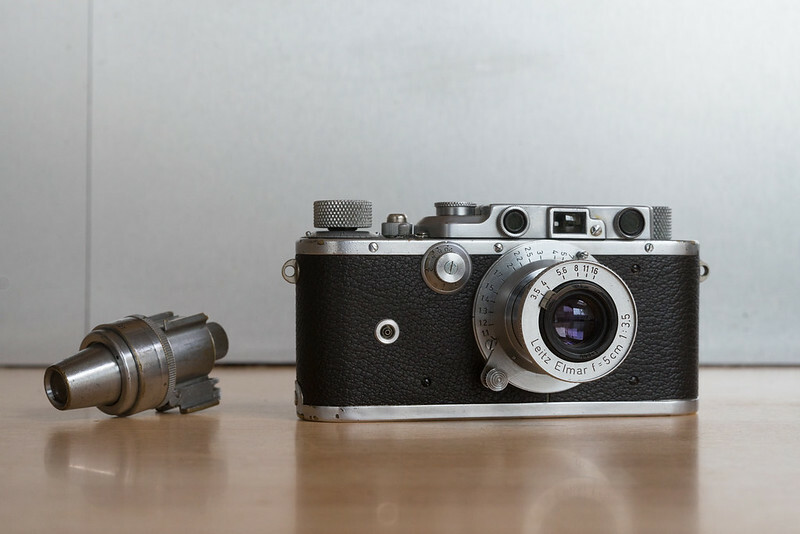 Especially in England in the 1940s where during the war there was no option to have your Leica sent to Wetzlar for an upgrade. So it is possible that the upgrades on the body were performed by a non-Leitz trained repairman, from his stock of original repair parts. That would explain the strange mix 'n match of features. 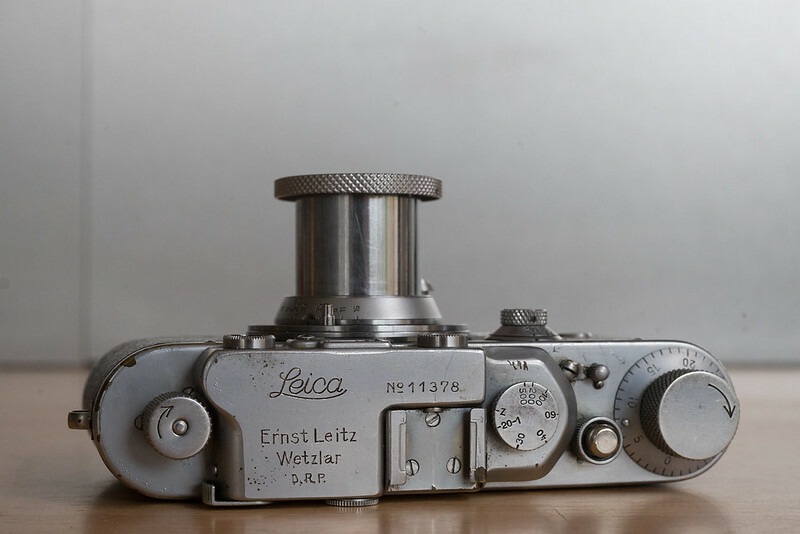 Another option is that the camera at one point was upgraded to a Leica III by Leitz in Wetzlar, and at a later stage was stripped from it's worn paint and re-chromed by another repairman. The nickel parts seem to support this. 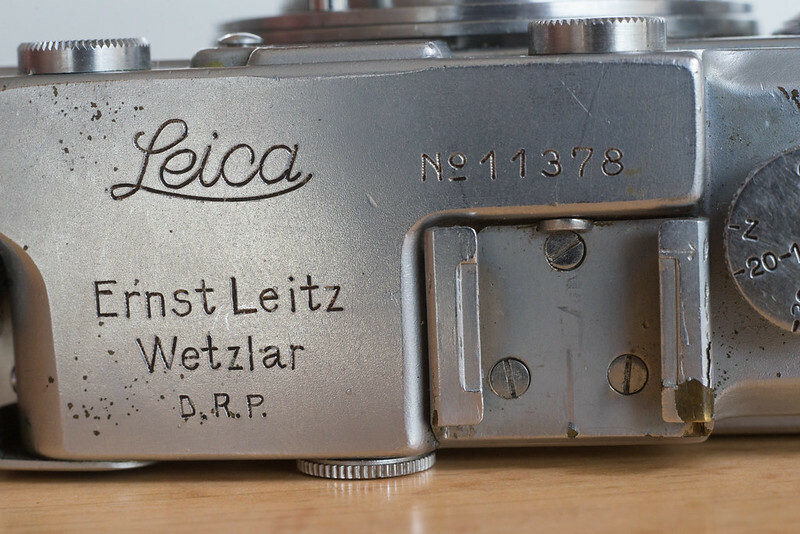 It would mean a first conversion by the Leitz factory in Wetzlar to a black paint with nickel Leica III. 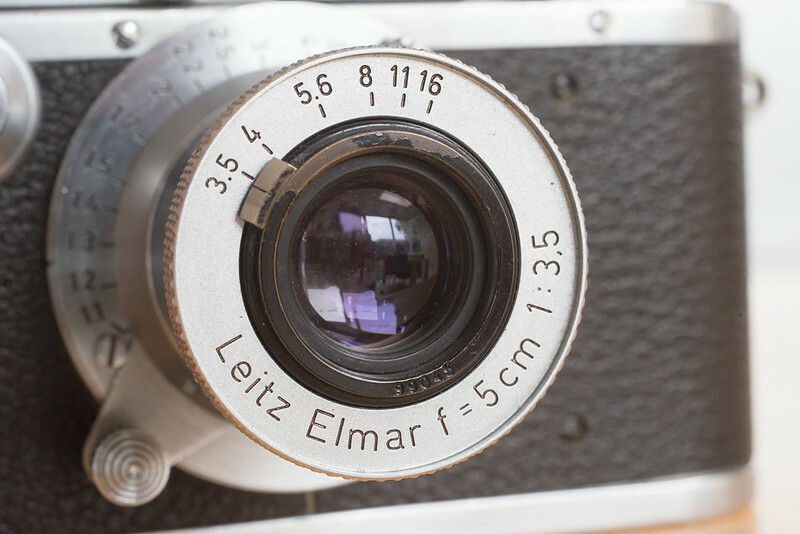 And subsequently a later conversion to a chrome camera by a non-Leitz repairman, who also installed a more modern flash sync on the front of the body. The lens on the other hand is a whole different story. The upgraded parts there, and specifically coating the lens elements, must have been done by Leitz. I imagine it is a rare conversion, since it must have been expensive at the time to have a whole lens rebuilt to a more modern model, while retaining the old serial number. This afternoon, I'm loading the camera up with some B&W Ilford film to go test shoot it, and see what the lens can do. Keep an eye open, I'll likely post results here after the weekend!